A highlight from our extensive 1996 “20-Years-After” retrospective underlines the timeless greatness achieved by Jos. Christoffel jr. wines. Mosel Riesling blossoms as it matures. 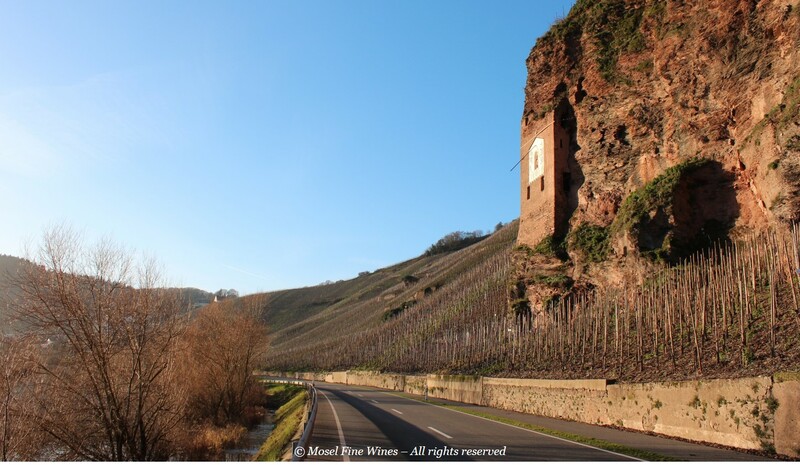 Every year, we dedicate the Spring Issue of Mosel Fine Wines to the beauty of mature Mosel. This includes the largest "20-Years-After" Riesling retrospectives made anywhere in the world. The retrospective of the 1996 vintage just published in Mosel Fine Wines Issue No 30 (Mar 2016) underlines the beautiful liveliness of the best 1996 Auslese wines. The best 1996 wines epitomize everything great about Mosel, being stunningly zesty and fresh, yet at the same time complex and delicately smooth. As so often in our Mature Riesling tastings, the Jos. 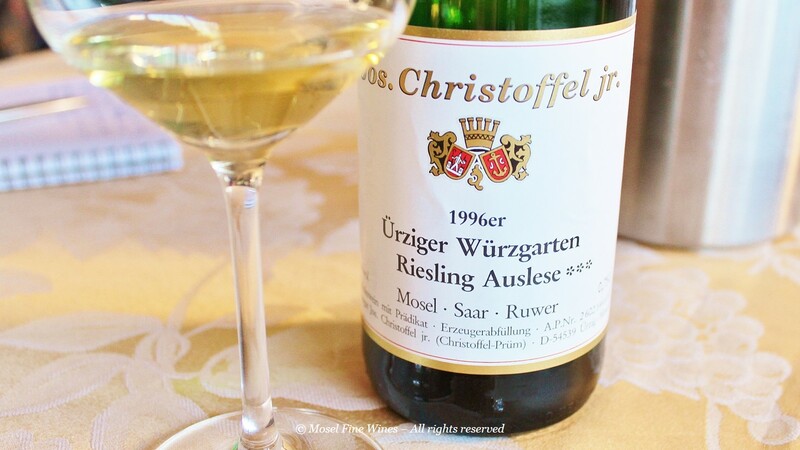 Christoffel jr. Estate hit the bull’s eye, this time with a stunningly fresh and lively 1996er Ürziger Würzgarten Riesling Auslese ***. Weingut Jos. Christoffel jr. is a small Estate in Ürzig with prime holdings in the best parts of the Erdener Prälat, Ürziger Würzgarten and Erdener Treppchen. Karl-Josef (KaJo) Christoffel, now well into his 80s, has run this Estate together with his brother Kurt (who unfortunately died in 1995) since the 1950s. We have been admirers of this Estate since almost 20 years now and this for a very simple reason: The Jos. Christoffel jr. Estate is one of the great treasures of the Mosel. Its wines age like few others and its mature wines are at the level of those of such super-stars as Joh. Jos. Prüm, Fritz Haag, von Schubert or Egon Müller. The wines are THAT good. Each year, wines from this Estate shine in our mature Riesling sections. One of our first wine of the month ever in 2009 was a stunning 2006er Ürziger Würzgarten Auslese *** GK from this Estate (which easily confirmed its legendary status in our 10-Years-After retrospective of the 2006 vintage published in Issue No 30 – Mar 2016). The recipe for this success? Classic winemaking with ambient yeasts in traditional casks, a thoughtful winemaker and great vineyards with often century-old un-grafted vines. The result? Bright, lively yet subtle wines which transcend each vintage. Despite a track record almost second to none, the Estate has long remained an insider tip among Mosel lovers. One of the first things we did when starting Mosel Fine Wines was to give this Estate the visibility it deserves and published a detailed description of the Jos. Christoffel jr. Estate in Issue No 7 (May 2009). Thankfully, the Estate has gained recognition since, in particular in Germany, where its wines are now in high demand! Also in 1996, the Estate’s Ürziger Würzgarten Auslese *** came from a prime parcel situated lower down the hill, near the Sonnenuhr, where it owns some very old un-grafted vines (see our detailed article for maps and location of the vineyards). Its ideal exposure, its thin soil and the additional warmth from the river of this sector formerly known as Ürziger Sonnenuhr all add this extra touch of ripeness needed in slightly cooler vintages such as 1996. The wine is exemplary for the style of the Jos. Christoffel jr. Estate: Incredibly fresh and lively, packed with flavors and yet gorgeously light on its feet. If you can’t find a 1996, don’t worry. As we already mentioned, the aging ability of all Jos. Christoffel jr. wines are almost second to none. Other wines can equally be exciting! We can only encourage you to hunt down (or nag your importer / distributor for) wines from this Estate and experience these Mosel classics yourself! A comprehensive 1996 20-Years-After Riesling retrospective was published in Mosel Fine Wines Issue No 30 (Mar 2016). You are a subscriber and miss this Issue? Simply send us a request by email and we will be happy to send you a copy. You are not yet a subscriber and wish to get this Issue? Subscribe free of charge by registering yourself here below and ask us for a copy by email.